There’s an old joking adage recited by experienced motorcyclists. Alas, for most of us, this is not a reality most of the time. There have been three occasions when I owned two bikes. Long ago I had a 1977 Yamaha triple and a replica of a John Player Replica (that is not a misprint), but the Norton was more of a cool objet’d art that a functional motorcycle. Later I had a wonderful Kawasaki ZRX and then a modified ZX 12R, both of which were kept company in the garage by a super-rare Muzzy Raptor. Now there was an attractive man cave garage! For the past three years I worked for Ride West BMW, and I was provided with a new BMW model of my choice each year for my duties. This bike shared garage space with my Triumph Speed Triple. Today I’m back to “just” my 2006 Triumph Speed Triple, now re-fettled into prime condition after being mostly a garage queen for three years. It has been cleaned to a fare thee well and is ready for a ride at a moment’s notice. Like today, For lunch. I do have a lottery ticket at all times in the keys and change box, and a bank would probably nod kindly if I wanted a loan for a second bike, but these days I prefer to keep multiple bikes as a “what if” contemplative topic. If I’m serious, I don’t really need two bikes, and with some thoughtful planning you probably don’t either. Let’s run through some considerations that might allow your one bike to do everything you want to do with a motorcycle. Magazines vs. reality: Few things are better than curling up with a nice fresh motorcycle magazine for a thorough investigation. For me, smooth physical paper is not matched by the wonders of the computer. There’s irony here, as you are reading this on a computer. While enjoying the latest issue, however, it’s important to keep in mind the intent. Magazines are not published to provide you with the best solutions for you. They are published to sell, and they sell by touting all manner of bikes, apparel, destinations, and farkles, all edited for content to delight and intrigue. The more you’re intrigued, the more you buy, and the magazines and manufacturers are happy all around. The essential concept is to make sure you purchase the right bike for you. This might not be the “best” bike in the latest 10 bike shoot out, or the fastest or best looking or most expensive. It just needs to be the bike that fits your taste, budgets, and needs. A little knowledge is a good thing, but slavishly following the opinions and tastes of others is a fool’s errand. Once you have the right bike for you, everything else is relatively easy. How do you want to ride? This changes over time. When younger, I sacrificed a lot to own the fastest sport bike I could, and would have purchased more extreme motorcycles if I could have afforded them. I was happy to be uncomfortable much of the time, because I wanted to be fast or (more factual) to look fast, or to be considered fast. I never did a track day, and never raced. My choices were driven by ego. A few years ago I had the chance to ride a Ducati 916 for two days. Extremely capable, very fast, and one of the most beautiful sport bikes ever. And total agony to ride – all the time. The Muzzy Raptor I owned soaked up bumps very well, if traveling at over 80mph. Below that it was a solid rock that delivered a crushing blow to your seat and back any time it encountered any surface irregularity larger than a dime. Do you do track days? Do you like to ride across the country? Do you commute to work? Ride off-road or on adventure trails? What percentage of each? In general, a smaller bike can be outfitted for cross country work much more easily than a Gold Wing can be adapted to a rush hour commute. I rode a Honda 450 Street Scrambler from Seattle to Florida and had a great time. I also rode to Minneapolis and back, California and back, and you get the idea. Most of the time I rode it to work, or for weekend adventures, and it was excellent at everything. For me. Do you want to look the look with a cruiser? Would you rather be a “Starbuck’s Adventure Rider” with the full Ewan McGregor adventure bike kit, even though you are unlikely to adventure off road or out of state, ever? I was frequently pained when a customer told me they wanted to ride across the country but did not have a big enough bike. This is nonsense, although I was never so crass as to say such a thing. I rode a Yamaha 250cc two stroke from Minneapolis to Seattle and back. I think it had 36 horsepower, on its best day. It would also cruise at 80mph. Is that fast enough? The size of the bike may determine how you cross the country, but it should not affect whether or not you choose to do so. Even then, on a long trip the only thing size really brings you is (usually) more comfort. How comfy do you need to be? You choose. Example. I have a good friend who recently parked his enormous BMW and purchased a… BMW 650 Scooter. He absolutely loves the new ride, and revels in the performance. It’s so much more comfortable that he’s pretty sure he has added ten years to his riding “career.” He’s been able to listen to his own voice, and not the cries of the masses. As we age, we may choose to trade “up” for ease of clambering aboard and ability to whip around at slow speeds, rather than deal with getting aboard and controlling 600 pounds or more of mass. Every time. Let’s skip ahead and assume you have a bike that you like. For you. Now what? How can you adapt it to multiple uses? Sound: Magazines rarely mention this in new bike tests, and yet motorcycle-generated “music” is so important. Do you like both the amount and tone of the exhaust? They are not the same at all. I always enjoyed the sound of a stock Japanese cruiser, and yet adding aftermarket pipes usually ruined it, creating a lot of noise but no music. Most of the BMWs I rode had a pretty utilitarian sound that was fine, and not really improved when I heard other BMWs that had been “piped.” One exception was a customer who had reamed out the exhaust on his BMW scooter, and it sounded like a 427 Cobra! The sound coming out of the machine was hilarious, and added a sprinkle of good humor to any ride. They are awful. Harley had a slick marketing campaign going for decades with stock pipes that strangled the engine. A healthy percentage of customers replaced them with “Screaming Eagle” pipes made by Harley – before taking delivery. Selling two sets of pipes for one motorcycle is healthy for the bottom line, and the Screaming Eagle pipes made the bike sound like it should have in the first place. So many people have made bad choices in this regard that the issue may become moot, as current and coming legislation will probably outlaw ANY swap of the stock pipes. For me, the Speed Triple was close to ideal as purchased brand new. 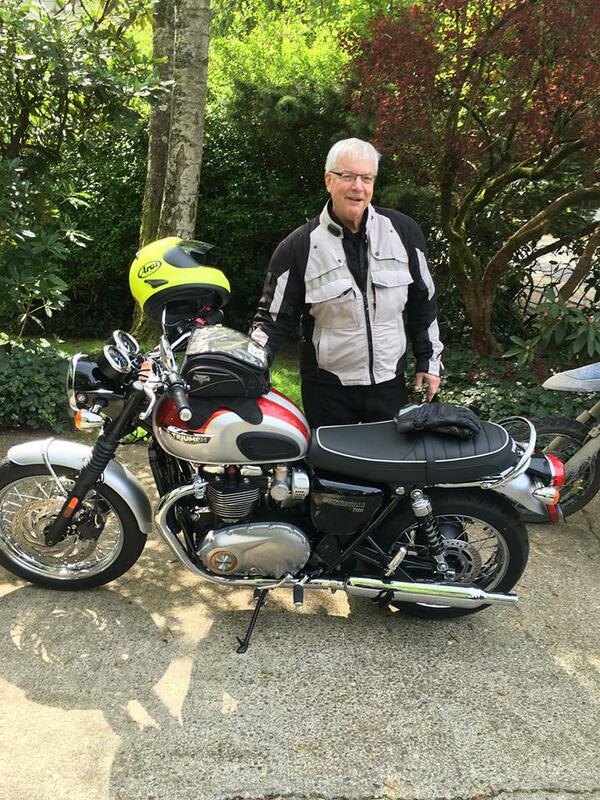 I eventually traded the exhausts for a set of Triumph “off –road” pipes, which look identical and I think are the same pipes with about 30% of the baffles removed. Not too soft, not too loud, but just right, and Goldilocks would agree. At about 6,000 rpm they make a sound so pure the hairs literally stand up on the back of my neck. At any speed in any gear it is creating fine music. In my humble opinion (? ), if you get the sound right you’ll have no need for a stereo or any other music delivery system on your bike. Tires: How many magazines do tire tests? Here’s a hint – all of them. The tests sell copies, but technological changes in tires come along fairly often. When you need tires, what to do? If you’re not doing track days, riding over the Himalayas, or have other specific needs, there’s a simple solution. Go to the dealer where you do business and ask the opinion of the folks at the parts or service counter. They have little vested interest, other than selling you the tires, and are smack dab up to date on what is working well on your particular brand and model. I’ve been doing this now for so many years and on so many bikes that I’d have to go look at my bike to be able to tell you what the Triumph is wearing this season. I couldn’t stand the suspense – they’re Michelin Pilots. Luggage: If you’ve never tried it, a multi-day trip is a wonderful experience. I learned more about people and about myself by riding motorcycles across the country than I did in college. Literally. And I hasten to add that I had an excellent college education. Many people purchase a humongous tourer to have “room.” These bikes are technological wonders, but it in addition to paying for them, you have to toss around all that heft, width, and length on every ride. Do you need huge panniers, a top box, and a fairing every day? Accepting that motorcycles are rarely about “need” and usually more about “want,” this could be a moot point. On the other hand, every article I’ve ever read for the past 50 years (!) matches my one experience – you always take more than you need. Over time you can cut back on the “musts” and eventually discover how little is required. My Triumph has five different options. A Triumph tank bag is an inordinately handy thing, able to swallow sunglasses, a hat, pipe and tobacco, spare gloves, maps, water, a spare visor, and more. I love tank bags, but some people hate them. I’ve added a Ventura rack system. For long trips a tall loop thing goes on which accepts a large back pack that slips down over the loop. For maximum capacity, say for a short camping trip or week or more long ride, a second bag can be zippered to the first one, giving a double back pack jutting up from the back seat. Not too sleek, although the bike gets better fuel mileage in this configuration. Most of the time the loop is replaced by a small luggage rack, and on that goes a nifty Nelson-Rigg tail bag. That holds a first aid kit, an air compressor, and a tire repair kit. I did all of my trips, for over twenty years, with no first aid kit and no tire repair kit or air compressor. Then I started leading rides, and felt a first aid kit would be a good thing. One year I had three flat tires in the same summer, having experienced none in the previous thirty years. On all three occasions I was in a group where someone had what was needed. I took that as a memo from the Great Spirit, and now I have them on any ride of any length over 20 miles. You make your own choices, but in general it is lovely to have luggage, whether hard or soft saddlebags (panniers) or other, that you can mount or leave at home as needed. Windshield: I am a heretic here. I hate windshields. I know experienced and talented riders who will not ride without them, but I demur. Without a windshield you always know which direction the wind is coming from. The front. With a windshield, there’s often buffeting and increased noise – sometimes a lot of both. True, you get increased protection from wind and water, and you’re much warmer on a bike with a big windshield and a barn door fairing. For me, heated grips and my non-electric riding gear will keep me comfy for all of the riding I am likely to do. Riding two up: If you ever intend to carry a passenger this may alter your original purchase choice quite a bit. Many bikes of a sporting ilk are clearly designed to have a passenger – never – or someone about 5’2” that weighs 75 pounds. I’ve carried passengers on other bikes, but not the Triumph, and I doubt I shall. It has a seat cowl covering the passenger seat, merely because I like the look of it. I’ve thought of losing the passenger pegs, but the bike would look odd without them as they’re part of the exhaust system mounts. Seat comfort: You can certainly purchase a better seat, and there are many companies competing for your dollars. I’ve never felt the need for it. First of all, a lot of seat discomfort is caused by the rider being in poor physical condition, or from wearing poorly designed gear. Secondly, an aftermarket seat can keep you comfortable for several hours, but I never like to ride that long at one stretch. I like to stop every 125 miles or so for fuel, or to have some water, or merely sit on a park bench and smoke my pipe and enjoy the day. Or to pee. Farkles: Motorcycles are often at the leading edge of technology, and that is part of the allure. How far do you want to go with adding stuff? You can get heated pants, jacket, gloves, and socks. You can have phone and music connections into your helmet. You can opt for cruise control, ABS brakes, traction control, and some 2014 BMWs will offer “hill holder” electronics. Modern dash displays offer entire menus to scan through to select your preferred settings for so many things. If you can get on a BMW K 1600 GT and memorize all the settings in less than ten minutes you’re amazing. The older I get the less I want. I’d opt for ABS brakes on a new bike, although they were not available when I purchased the Speed Triple. I will never again purchase a bike without heated hand grips, and a center stand must be fitted, either as original or an aftermarket item like the excellent SW Motech unit on my bike. I would accept other stuff if the bike came that way stock, but not pay extra for any of them. Your choices will be different. To hammer on the same note, the theme is choice, and making choices that fit your bike to as many uses as you are likely to put it to, My Triumph can commute, go immoderately rapidly on winding back roads (it’s best use), or be used for touring the state or the country. That is everything I want a bike to do. Of course, let’s see – where did I put that lottery ticket…. This entry was posted in Equipment, Marketing, Motorcycles, Travel. Bookmark the permalink. I completely agree that one bike is enough if you just ride on the street, and in fact my current KTM 990 Supermoto is a similar bike to your Triumph. My future bike will be a 1290 Superduke-even more like your Speed Triple-just a bit lighter and more hp-I like hp! Where I disagree is if you ride off road. For me that calls for a second bike, which for me is a good dual sport, and if I had to keep only one bike it would be the dual sport because it really can do it all. That said, for pavement only rides, a more street oriented more powerful bike is just more fun for me. Also if you happen to be a serious track day junky, then a “beater” track bike can be nice as there is less $$ involved if you crash it. If you just ride pavement and do not do many track days, then one bike is plenty!